I woke up to my birthday at Phakding (2652 meters, 8700 feet) and I was turning a decade too! But anyway that was a very minor happening on the larger scale of things! In the mountains as I hit the bed by 7.00 pm or so, I wake up bright and fresh. I had an early breakfast at the Beer Garden Lodge and we were ready to start again. I had been warned by people about how steep the steps to Namche Bazaar (3440 meters, 11286 feet) were so I was expecting it. Someone also said their group could not go beyond because one of the members had upset her stomach on something she ate in the lowlands. That didn’t sound too good. Then on top of it at the breakfast I met a person who said he had to turn back from Tengboche (the next stop after Namche) as he found the climb to Namche too much and could not adjust after that. Coupled with my thoughts of the previous day all this didn’t sound good at all. The Milk Run till Lunch and a Little Beyond: Deepak had told me that we would eat an early lunch on the way. I am quite lax about food in the plains but I do not dare to miss a meal on the trek or to be casual about my liquid intake. After all these are small things that I can do from my side to ensure that the trek goes smoothly. I was fine on the walk and a little perplexed as well, the walk for quite sometime went relatively flat. That doesn’t mean I would not get tired. 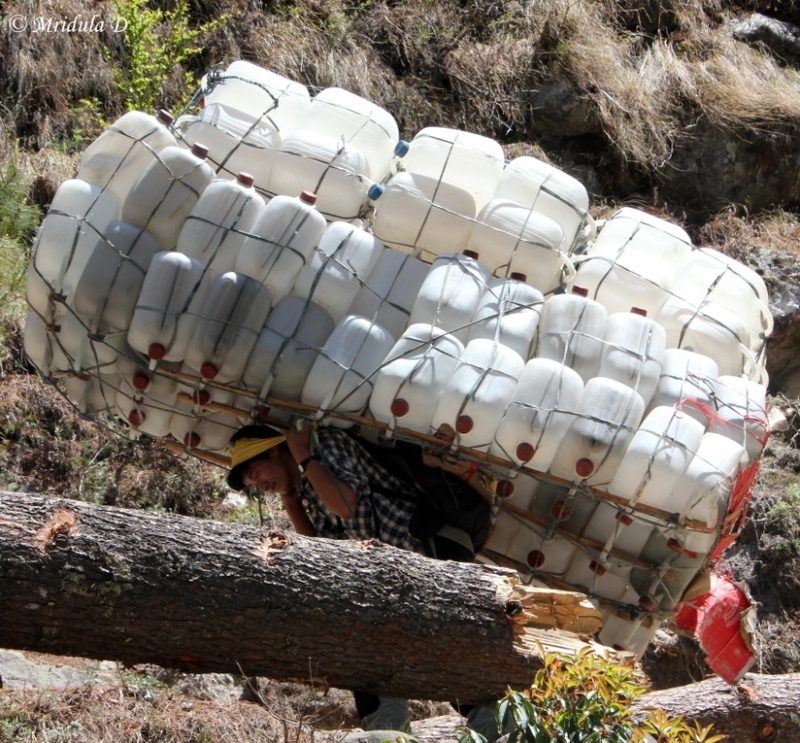 But whenever I would start venturing anywhere near self pity it was not difficult to find people carrying unthinkable loads! I was told these were empty cans but still! And on self pity, I anyway paid good money to do this trek and I like to call walking from early morning to late noon (and many times even more) a vacation as well so there was really no scope for self pity! It was still without any real struggle I reached the lodge where we halted for lunch. I once again had Dal Bhaat but by now I was not liking the strong smell of spinach that they customarily served in all vegetarian dishes. After lunch we walked along the River Dudh Kosi and we crossed many bridges. My cell phone was working and I got calls from home and friends. It was good to be able to remain in touch with people back home. 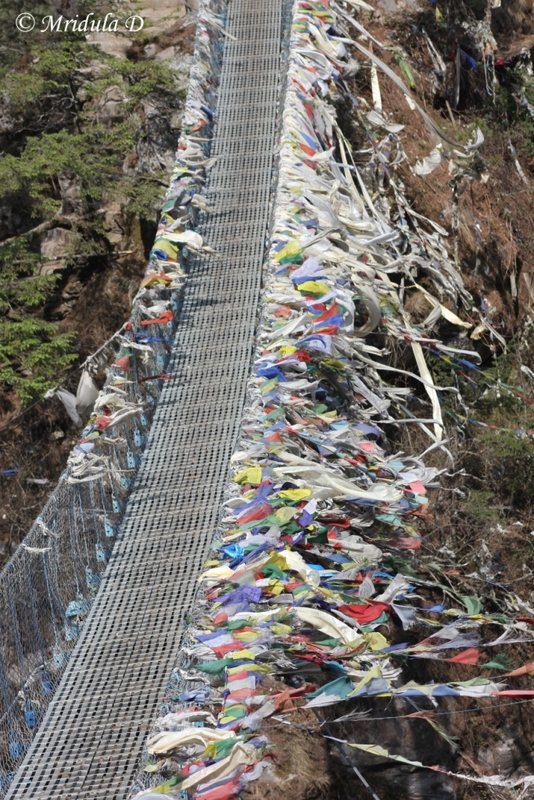 Soon we crossed this last bridge that had prayer flags all over it. Once we were on the other side, pretty soon it was time of reckoning. The dreaded climb to Namche Bazaar started. As I was expecting this, I was fine. Only I didn’t like the hours and energy we had to spend to reach here, I knew about the climb but didn’t know that even to reach the climb I had to walk for a few hours! 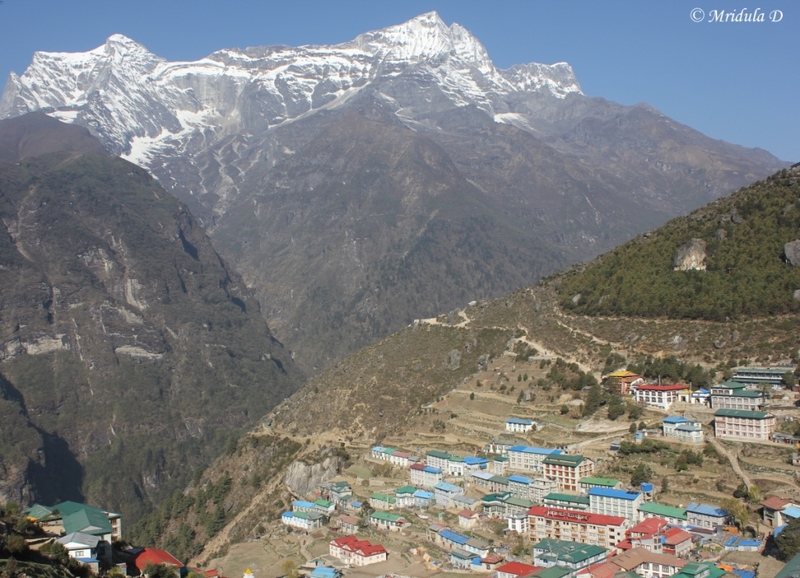 The Climb to Namche Bazaar: What to say about the climb? It is pretty much the same, what you get to read and hear about it. It just keeps going up. 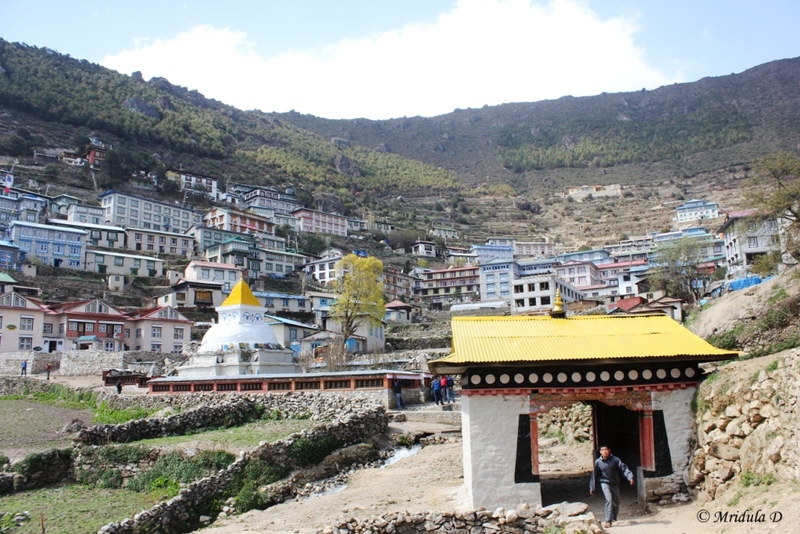 I was banking on Day 3 to recover as we were staying at Namche to acclimatize. After a climb of an hour I met two people who looked Indian. We chatted and one of them told me, “It was four of us who stared and we are now two.” We grunted about the climb for a while and then I moved on. They were from West Bengal. I walk incredibly slowly but I can walk for long hours. And till date I have never said no on a walk. I have got tired, I have been miserable but I never say that I will not walk any further. So on and on it went one spiral of climb after another. For me the worst part was not knowing how far the place actually was. I like it a lot when I can see the place where I have to reach. No such luck with Namche Bazaar, all I could see was the next curve and the climb. I could have asked Deepak but I was worried that I would get the standard pahari answer, “Thoda door aur hai” (it is just a little way ahead). And I hate that answer. Tell me that at my speed it would take 4 hours and I am fine but don’t tell me it is round the corner because it is not! It is only later I realized that Deepak would give me correct answers if I asked and not ’round the corner’ one. And for that I am so thankful to him. But this was just the second day on the trek and I was not aware of this fact. So after walking for ages I concluded that Namche Bazaar would never come and I need to eat a chocolate (the chocolates bought in Malaysia were put to good use on this trek). So I took out a chocolate and Deepak, Gokarna and I ate big chunks of it. And a few steps after that we reached the Namche Bazaar check post. A permit to trek is required in the region and we had to show it at check posts. 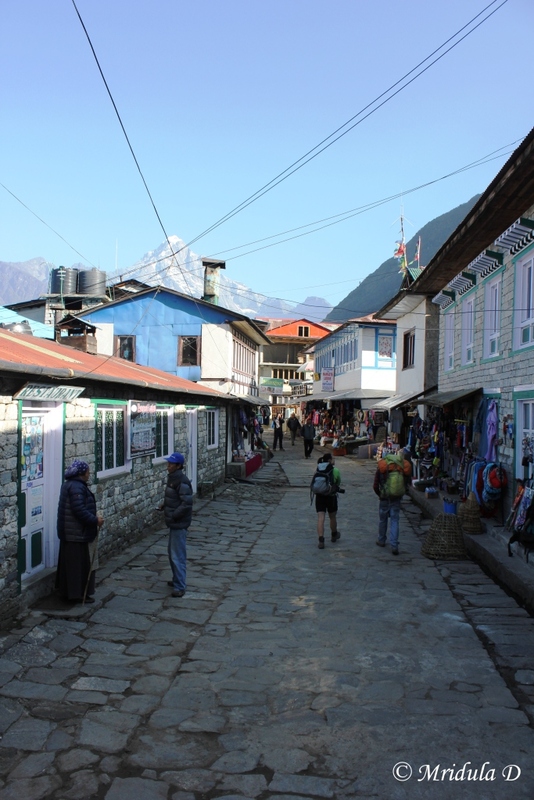 That meant finally Namche Bazaar was round the corner! The small gate in the front to the picture is the entry gate to Namche Bazaar and it did not take long in coming into the view. You can see that homes and lodges start from the lowest terrace but Deepak and Gokarna (Diana’s guide) had a penchant for choosing the lodge on the last ledge of any village. 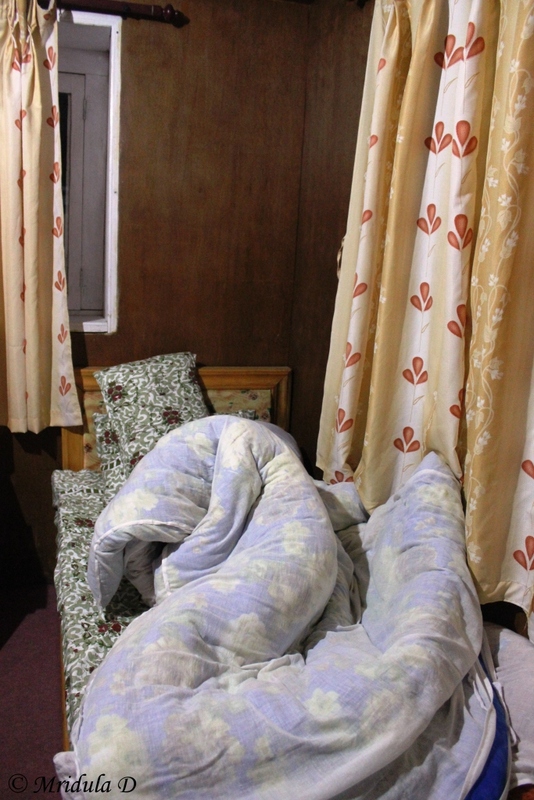 So we walked to the Everest View Lodge at the upper ledge and soon I had a room with an attached bathroom again! I did what I am good at, crashing for a few minutes immediately. Of Birthdays and Medical Schools: I met Diana in the dining hall of the lodge and I mentioned that it was my birthday. I asked at the lodge if they had an apple pie but they didn’t. I settled for rice porridge (kheer) and tea as my birthday bash! In return Diana told me that she was waiting for the results for Medical School which would come out on 15th but as per Canadian time. I drank a lot of tea (I find it easier to gulp tea than water to maintain the liquid balance) and ginger tea was my favorite. After lunch it was time for nap and then a 6.30 dinner. I usually like to get out and take pictures in the evenings but in the mountains there was not a single day when the clouds didn’t rule and that was the end of sunset and evening light. 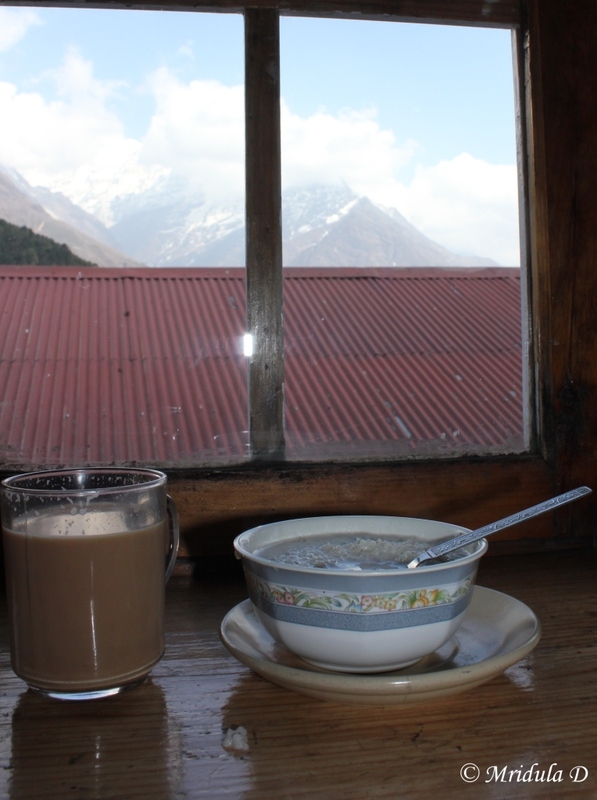 Day 3, Rest and Acclimatization at Namche Bazaar: The day 3 brought the good news at the breakfast that Diana made it to medical school! After a leisurely breakfast Deepak offered that I should at least walk up to the Military Museum to acclimatize. I agreed to do so. Diana was going up much higher. Can you see the cloud on the left in the picture? Look at the first highest peak after it. That is Mount Everest peeping out. You still do not believe me? 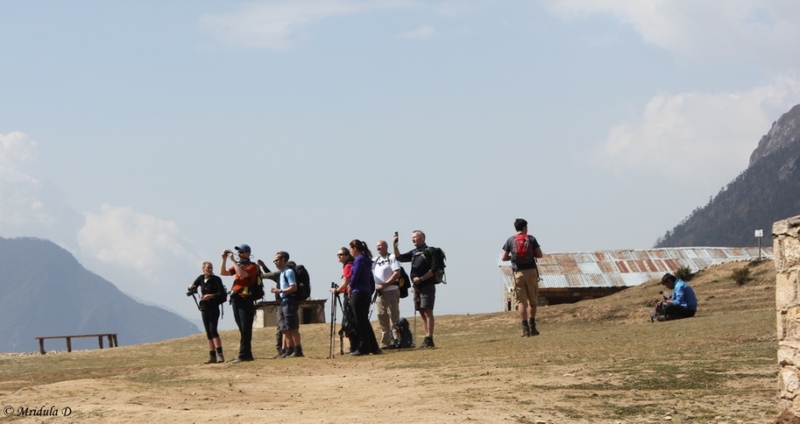 Well here was a group of trekkers having a go at it and the only person who looked disinterested is the guide. No One can Resist Everest except the Guides! After this I checked out the museum too but my head was full of altitude so I came out after a while. We headed to the lodge. 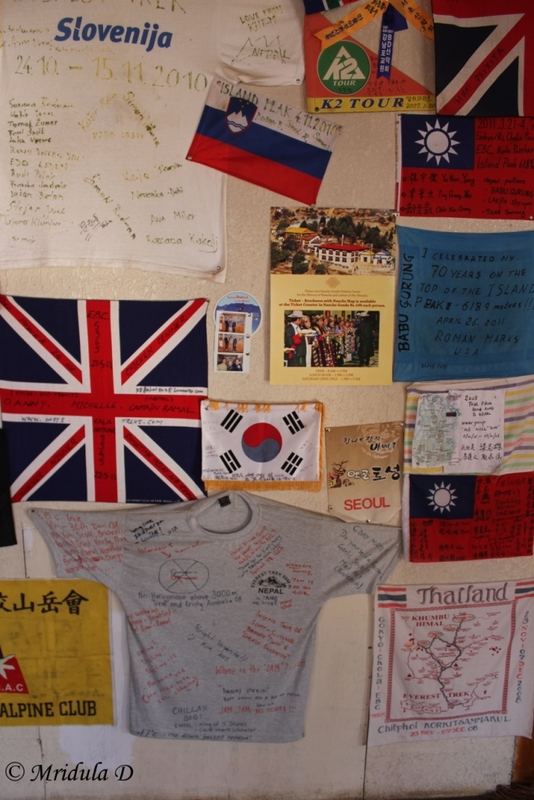 The lodge had a great collection of T-shirts, flags with quotes on them. This was true for many lodges on the way. I met that Indian gentleman from West Bengal once again who was trekking in a group of 4 that got reduced to 2. He informed me that he was now alone on the trek! His friend gave up after Namche Bazaar! Once I reached the lodge again it was tea, food and relaxation. At this height I was not having any headaches or breathlessness at rest and all those other dreaded symptoms of Acute Mountain Sickness (AMS). I also met Pankaj on this trek who wanted to climb up to Island Peak. He had been to Everest Base Camp last year and we shared many stories on the next few days. Namche is a stunning place to be! It has a bazaar and a big one (by trekking standards) at that but I had no energy to explore it. 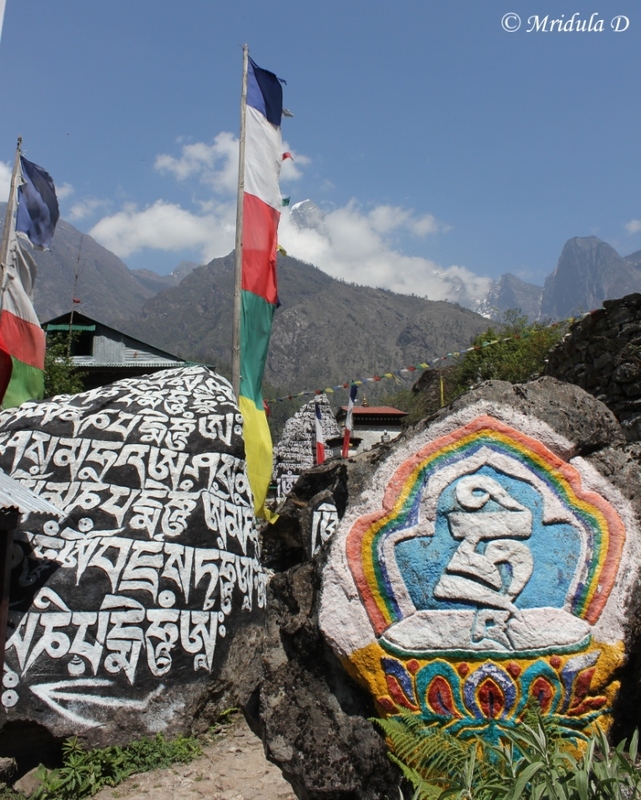 The next stop on this trek for me was Tengboche and I didn’t even had a warning for what was in store for me. 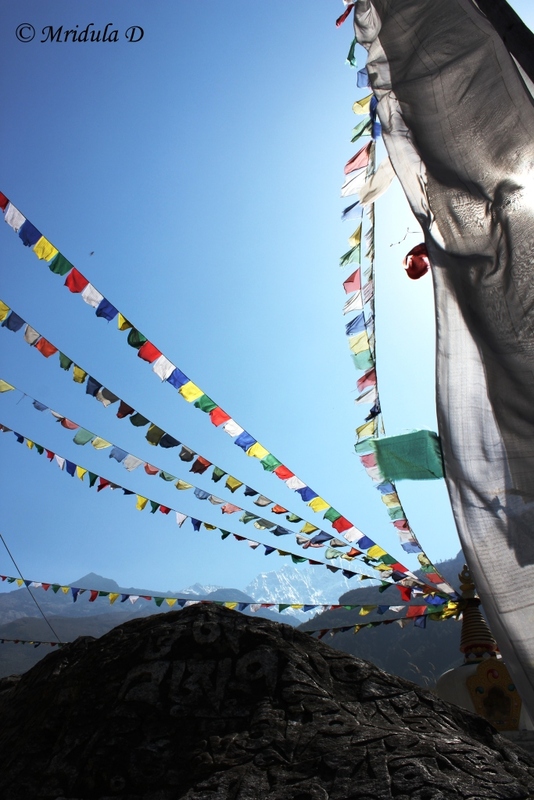 Everest Base Camp trek has been on my radar for long. However I would always let it go thinking it would take too much time, the season will not suit my teaching schedule etc etc. But all this changed when I met Sir Chris Bonington. During his talk he asked if anyone of us had been to Everest Base Camp and seen Khumbu Icefall? No hands went up. I was determined to change this for his next year’s talk! Also while chatting with him I asked if mid May was a good time to trek up to Everest Base Camp and he said it was indeed a very good time. What more encouragement would I need? Then came the task of finding an agency to do my bookings with. Since Chhavi is too small to trek with us my husband and I take turns to trek and I was going to do this solo. 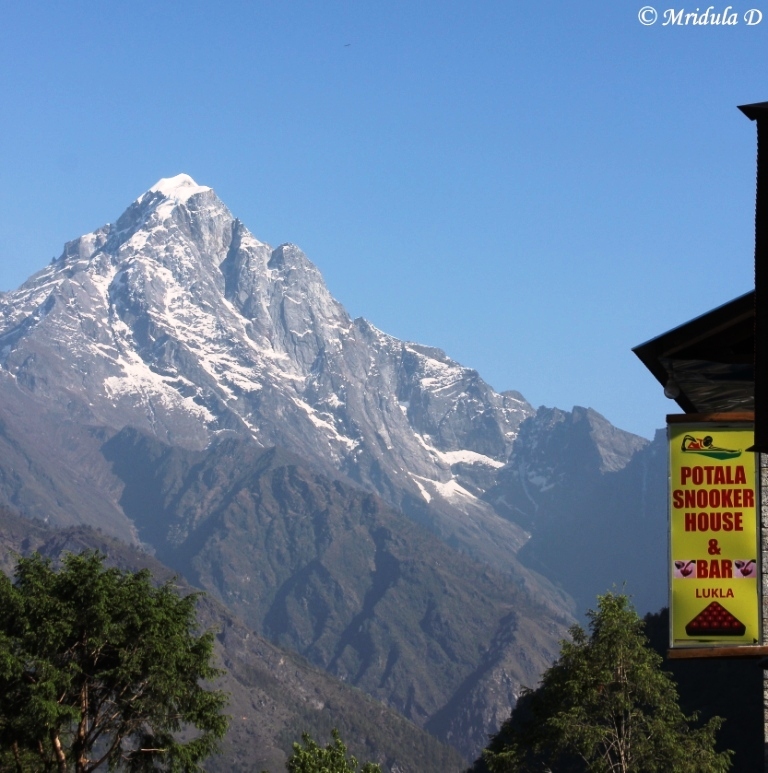 For a lot of my travel needs I have relied on the recommendations from Indiamike and this time also the good folks gave me the name of Puru Timalsena and his agency Above the Himalayas Trekking. We talked over email and I liked what I heard and decided to go with them. To Nepal via Malaysia: While I was counting days to get started on the trek, an speaking invitation from Malaysia came my way. The dates to Malaysia were not clashing but I was on flying from Malaysia on Thursday (May 10, 2012) working on Friday in India (May 11, 2012) and then flying to Kathmandu on Saturday (May 12, 2012). That made it so tiring. Thankfully my trek started only on 14th May. There was a pick up arrangement for me at the Tribhuvan International Airport at Kathmandu. I stayed at a basic lodge called Wonderland, the Trekker’s Inn. Puru had offered me accommodation at a 3 star property but I told him I needed a clean room and hot water and that is exactly what I got. The free wifi at the inn was a big bonus. I tried to recover as much as I could on 13th and that meant catching up on sleep. I also managed to get a Ncell sim at Kathmandu so I had a local number in Nepal. Apart from two places it worked on most of the route including at the Everest Base Camp itself. I met my guide Deepak for the first time on 13th May too. He was going to be my guide and porter as I am not good at carrying weight and walking at an altitude. Air Rescue? What Air Rescue? : While Puru was taking down the details like emergency contact numbers, health insurance policy etc, he asked if my policy covered air rescue too? I was stumped, I had no such deal, it didn’t even occur to me. So I asked if I could get one from Nepal. He said both Nepal and India were not known for offering it and in the end I decided to go ahead without any air rescue coverage. I have lived to tell the tale but I would like to highlight this to you if you are considering trekking up to the Everest Base Camp. Apparently it is easy to get from many countries but I was not even aware of this before starting from India. And the Journey Begins: We were flying from Kathmandu to Lukla. Deepak was to pick me up from the hotel at 5.20 am. There was another girl Diana trekking with Above the Himalayas and staying in the same hotel and her guide’s name was Gokarna. So at 5.20 4 of us boarded the taxi and started upon our adventure. If you do not wish to fly, Lukla can be reached from Jiri by land but as I have not done it I do not know much about it. I just thought I would mention this as an option, I think Jiri Lukla is a 7 days trek. Lukla Airport: We had the flight with Tara Airways (formerly Yeti Aiways) and it was a small 1X1 plane. I hate such planes because they get thrown around like anything in turbulence. Thankfully the flight is small about 30 minutes. I was lucky there was hardly any turbulence on this day. Within no time the plane was making a touch down. And by god what a runway it was! The Lukla runway is on an incline and not straight! So the plane goes up after the touch down. Anyway by the time this would sink in we were already at a lodge called ‘The Nest’ ordering our breakfast. I ate a banana pancake with honey and tea! Walking from Lukla ( 2860 meters, 9383 feet) to Phakding (2652 meters, 8700 feet): If you compare the heights you can see Phakding is actually lower than Lukla so it meant most of the journey was downhill. We walked through the main bazaar and it was a lively affair. I was also found intriguing the signs like snooker and bar. Soon we crossed a gate that is devoted to Pasang Lhamu Sherpa, the first Nepali women to climb the Mount Everest. Many considered this day’s walk to be a cakewalk. I would agree that terrain wise it was not too difficult. But I still found it tiring. The beautiful scenery along the way helped in keeping the mind off fatigue, for fatigued I was. After all Lukla itself is at 9000 plus feet and walking immediately on this height was not so easy for me. 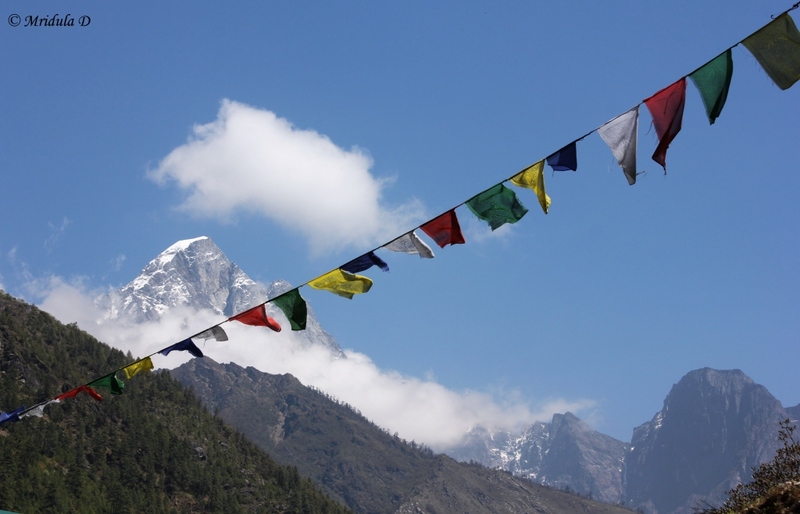 I walked through looking at the peaks and prayer flags but the major concern was to reach Phakding. And for me it was talking its own time in revealing itself. Photography while walking is a task in itself, most of these pictures were also clicked when I was out of breath and needed a reason to slow down! Finally after walking for something between 3-4 hours we reached the Beer Garden Lodge at Phakding and this was my room for the day. Deepak left my luggage and I promised him to show my face in a while in the dining hall. Even though this was an easy walk I was completely knocked out. This room had an attached bathroom and people who trek can imagine what a luxury it was! I collapsed on the bed and slept for 45 minutes without stirring. When I woke up I was not sure where I was, in Malaysia, India or Nepal. I have to admit I was quite upset as well. If I was this tired after such a small walk, I was left wondering how would I cope up with more strenuous days and higher altitudes? Anyway pushing the doubts aside I went to the dining room and ordered Daal Bhaat (Rice and curry with vegetables) for lunch (you can buy T-shirts in Kathmandu which say ‘Dal Bhaat Power 24 Hour’). I also had many ginger tea. In city I drink tea without sugar. On the trek every cup of tea that I consumed had a thick layer of sugar in it. I also met Diana at lunch and she had walked the same distance in one and a half hour! After lunch I slept for 2 more hours. Dinner was around 6.30 pm and I ate noodles but couldn’t stand the smell of the cheese (which I otherwise like so much). I hit the bed around 7.00 pm and I had sincere doubts about my survival on the trek, I was still feeling so lousy. But then I decided to take one day at a time and get a good night’s sleep. Our next stop was Namche Bazaar.